Like Japan, China and Russia, Google does not have dominance in the South Korean search engine market. With an approximate 70% share of the South Korean search market is Naver, and second to Naver is Daum. Neither of which resemble what we would probably class as traditional search engines, displaying traditional search engine results pages. Naver burst onto the South Korean search scene in 1999 and one of the key differences between the Korean search engine and Google is that Naver doesn’t crawl the entire internet and form indexes and shards of data. Instead Naver can be likened to a directory service, as businesses who want to rank within the SERP need to register with Naver, and create accounts. Naver’s SERP focus is on UGC (user generated content), popular social media interactions and paid listings. There is an element of organic search listings within Naver, however the best way to be discovered in Naver is to make yourself as visible in as many areas of the SERP as possible, and not rely solely on SEO. Content is very important, make sure it’s unique and in Korean, not English. This leads me onto the next part of the guide, dissecting the SERPs. As you’ve probably gathered by now, Naver’s SERP is different to Google’s. To demonstrate this, below is a search for the generic term ‘hotel’ in native South Korean (호텔). Rather than post a long image of the whole SERP, you can view the whole Naver SERP here. It is possible to conduct a search in Naver and not see a single organic result. Being mobile friendly is essential due to South Korea’s high smartphone penetration and usage. I think it would be fair to say that Daum’s search results are a lot more focused on users and local. When I talk to people about Naver & Daum, I liken them to Coca-Cola and Pepsi. Coca-Cola is probably the leading carbonated drink product out of the two, but Pepsi to combat it’s rival diversified into things such as Pepsi Music, to increase it’s brand visibility. Naver and Daum are similar. It’s estimated that Naver has 60%+ of the South Korean search market, while Daum has ~15% and Google ~9%. To combat this Daum moved first into offering things such as music search, object search, barcode/QR code search and voice search across multiple devices. Daum has also seen the greatest rise in local advertisers on the search platform. Naver is much more than a search portal. There are a lot of other services that feed into and influence Naver’s search results and as a result the space for organic results is at a premium, or in some searches is non-existent. This is like Wikipedia, and just as authoritative for Naver’s search results. Setting up a page for your brand/company in this Encyclopaedia should be a campaign default, like setting up a Google My Business or Bing Places listing. The Knowledge IN is fed from a number of different sources, including the Encyclopaedia – but mostly from the Q&A section. This search is extremely semantic, so you need to approach the Q&A section like Yahoo! Answers (similar to how you would optimise for Japan). When you register your website with Naver, you are automatically set-up with a Naver blog. 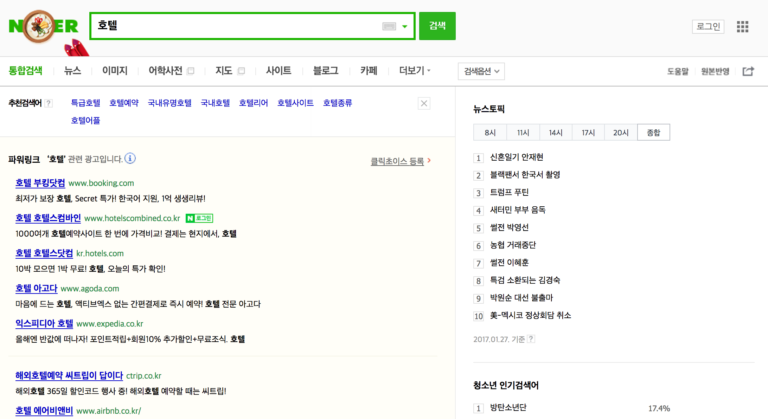 Blogging and peer-to-peer communications in South Korea are extremely important, and Naver includes blog results as it’s own section within it’s search results. 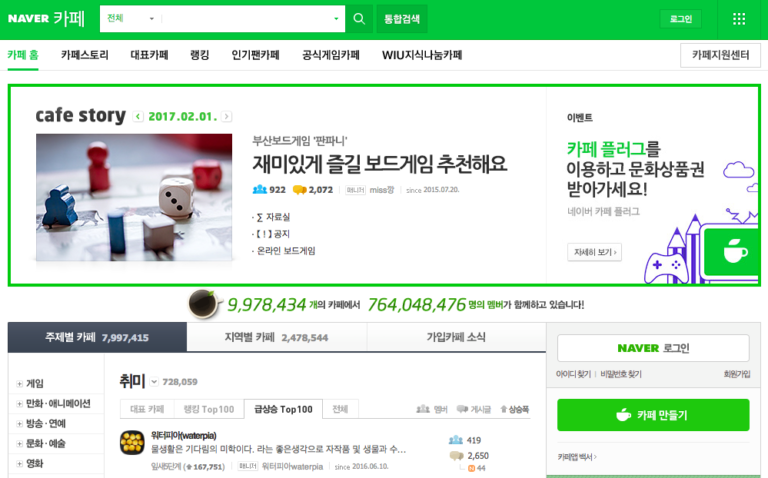 Blogging on your own website may be enough in Google, but in South Korea you need to publish unique (and quality content) on the Naver Blog too. Succeeding with a Naver Blog requires thorough commitment, a well structure content calendar and extensive keyword research. Similar to Google+, Naver Café is a social community in South Korea, but unlike Google+, it is heavily used. Café influencers can be connected with in order to aid your marketing efforts, so basic social media practices and influencer research practices apply. Building a following (increasing your fans/likes) can help your visibility within Naver’s SERPs, but posting regular high quality content and running competitions will definitely help. Facebook is a popular social network in South Korea, and Naver does pay attention too and reads Open Graph tags. Implementing standard OPG & microformat data should definitely be done. Naver does not support the HREFLANG tag and format. Like Bing, you need to use the HTML Meta Language Tag. Please be sure to visit Dan Taylor’s site here for other great SEO information. PreviousPrevious post:유럽에서 온 프리미엄 아기용 액상 조제유(액상 분유) 가 한국에 첫 선을 보이려 합니다NextNext post:Is keyword research really important?